This is part one of six journal entries that I have for Marjorie Strelesky, the sister of my paternal grandmother Eunice (Strelesky) Lightcap. Today is my 74th birthday and I think this is a good time to start this journal. 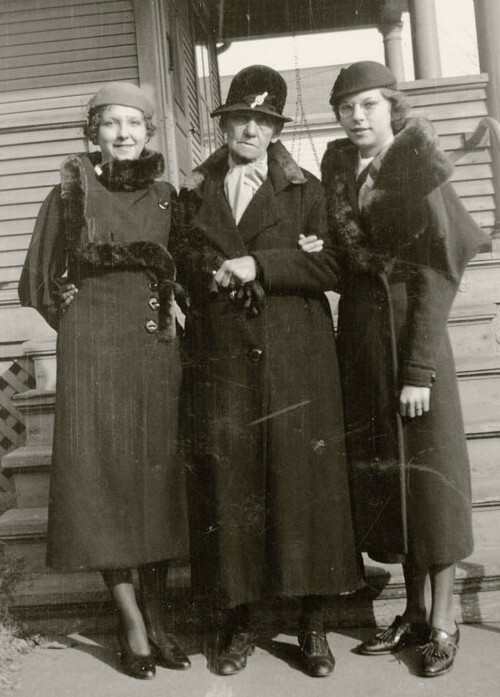 I’d like to start with my earliest Christmas and tell you about the Aunt Norma [her mother’s sister] I knew as a child. She was so different from the Aunt Norma you all knew later on. She always made a nice Christmas for me. There were dolls with a wardrobe of beautiful dresses. She even made coats, hats, shoes, and stockings. One year she made a cupboard out of apple boxes and with it came the cupboard full of dishes. She even had a glass door on it so my dishes would show. My earliest memory of a Christmas tree was one with candles on it. One Christmas the tree caught on fire. My dad [Jack Strelesky] was there and he picked up the tree, ran to the door, and threw it outside. Aunt Norma was angry. She had a lot of beautiful ornaments on it and, of course, they were all broken. Whenever the tree was lit with candles there was always a bucket of water beside it to put out the fire. Before anyone could get to the water my Dad went into his act. I can just see Dave Humphrey doing the same thing. The next year we had electric lights on the tree. They were some lights. Many years later Irene was putting them on her tree as late as her Cedar Rapids time. I lived with Aunt Norma and Uncle Burt in one part of Omaha and my Dad, Herbert and Alice lived off in another part of South Omaha. Aunt Norma told me all about Santa Claus, but best of all she took me to church to see the crib and tell me the Story of Bethlehem. I remember being terribly upset because the baby Jesus was cold. I wanted to bring one of my doll blankets to church to wrap the Baby up. After I started to school at St. Mary’s and learned my prayers, it was Aunt Norma who taught me to say the rosary. As I remember she was very devoted to rosary. I can see it yet. It was very long and the glass beads were a beautiful shade of blue. It had a large crucifix with mother of pearl behind its corpus. The first time I heard “Silent Night” was in kindergarten. The 8th grade put on a Christmas Pageant and that was one of the carols they sang. I thought it was the most beautiful song I ever heard, and I still do. Many years later when living in Dubuque at Grandma’s [Josephine (Uhlrich) Sanders] house. I remember someone put a record of Silent Night on the record player (victrola) and Grandma cried. It brought back memories of Uncle Fred. He was dead then about 4 years. When I was six years old I went to live in Dubuque with Grandpa and Grandma Sanders. Our Christmases there were wonderful. Uncle Frank [Sanders] and his family lived one block down the street and Uncle Al [Sanders] and his family lived two blocks away on Lincoln Ave. The Christmas tree was decorated very close to Christmas and a sheet was put up between the living room and dining room to hide the tree. No one was suppose to see it before Christmas Eve. One the afternoon of Christmas Eve we at Grandma’s house opened our presents from our own family. I always got a new paint book and water colors if I needed them. I always enjoyed painting pictures so this was a treasured gift. There were many other things too. I well remember my first Christmas at Grandma’s house. I wanted a cap and scarf set so badly and I got a lovely tan one. I was so happy because Aunt Norma had reared me to think it wasn’t want it was what you got. When I was alone with Eunice [her sister] I said “Gee I got a cap and scarf that matched.” Eunice said “I don’t see why you are so surprised; it was the only thing on your list.” Eunice was used to getting what she wanted – I wasn’t. Another thing I got which I’ll always remember was two pair of stockings. Aunt Norma kept me in black stockings and I hated them. These wonderful hose were sort of a plaid and yet there were designs in them. One pair was gray and the other tan. All the girls at school had them. I was so thrilled with stockings that weren’t black. Every so many years styles come back. We always said if you keep something long enough it would come back, but those wild stockings have never come back in all the 75 years.